No, we will not let it go! Who gave the order to stand down? Despite the smell of petroleum becoming overwhelming due to the terrorists setting the building on fire in an effort to force you out, you force yourself to remain calm and hopeful. You tell yourself, "Everything is going to be OK. I'm an American. We never leave Americans behind". But the Calvary never arrives to save you – not because they were not ready. The expected help never arrived because someone high in the Obama Administration, for political reasons, ordered our military to "stand down." 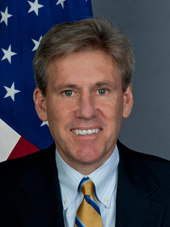 Ambassador Stevens' rescuers were ordered to "stand down." Imagine yourself a former Navy SEAL in Libya, aware of the terrorist attack on our consulate. You and your buddy, also a former SEAL, desire to fight the attackers until the Calvary arrives. You are ordered to "stand down." But you are a former SEAL, you can not simply sit back and allow terrorists to murder Americans. You and your buddy disobey orders and come to the rescue. Our planes are not in the air because someone high in the Obama Administration, for political reasons, ordered our military to "stand down." All your laser did was tip off your location to the Islamist terrorists. Former U.S. Navy SEALs Tony Smith and Glen Doherty were killed. Why? Because someone in the Obama Administration gave the order to "stand down." If a republican were in the White House, the mainstream media would be investigative pit bulls, all over the Benghazi scandal "like white on rice," as my late momma would say. And yet, remarkably, several months after the attack on our consulate and the murder of four Americans, the mainstream media does not appear to have the slightest curiosity about who in the Obama Administration gave the order to our military to "stand down." Despicable! While Obama's protective mainstream media refuses to care, my fellow Americans and I care deeply and will discover, who in the Obama Administration gave the order to "stand down"?